You are currently browsing the tag archive for the ‘Hans Christian Andersen’ tag. 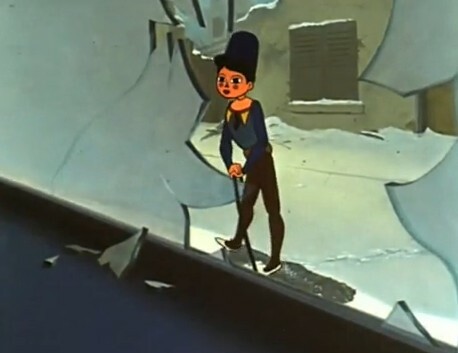 One of the most poetic animation films ever made, ‘le petit soldat’ is a very inspired re-telling of Hans Christian Andersen’s classic fairy tale of the steadfast tin soldier. In this version, written by poet Jacques Prévert and undoubtedly inspired by the recent experiences of World War II, the soldier is actually an acrobat doll who gets drafted by a humming-top into an unexplained war. In his absence, Jack-in-the-box tries to seduce his love, a ballerina doll. And when our little soldier finally returns from the battlefield, injured, Jack tries to kill him by taking his heart-shaped winding key away and by trying to drown him into an icy river. Fortunately, in a dramatic climax, the ballerina saves her love from drowning, while the villain gets stuck in a gin-trap. ‘Le petit soldat’ is entirely told in pantomime and a great improvement upon ‘La flûte magique‘, Grimault’s film from the previous year: its storytelling is better, its settings more dramatic, its characterization more convincing, and its animation more sophisticated. 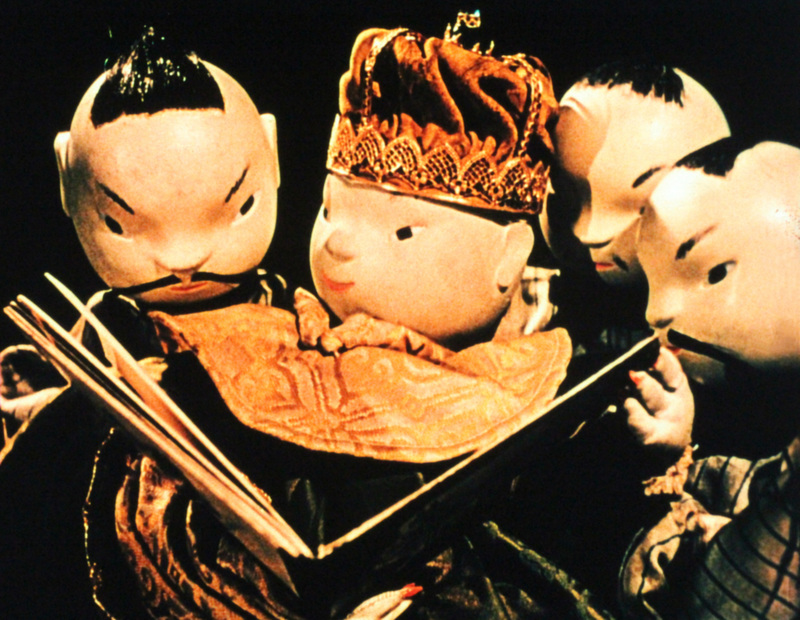 Indeed, this beautiful short about triumphant love arguably is Grimault’s masterpiece, even topping his beautiful, but uneven feature film ‘Le roi et l’oiseau’ (1952/1980), which is also based on a Jacques Prévert story. When death takes away her child, a mother gives up everything to get her back. 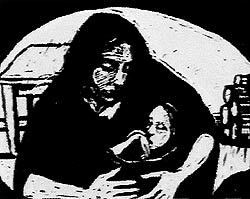 ‘Death and the Mother’ is Ruth Lingford’s re-telling of a classic fairy-tale by Hans Christian Andersen. It’s an animation masterpiece: its strong and gritty animation, the beautiful string quartet music by Nigel Broadbent, the subtle sound effects – all add up to a very strong, dark and emotional film. Lingford makes clever use of the computer to create a very graphic film that looks like an animated woodcut. In an age in which computer animation almost equals 3D animation, this is a refreshing technique, with a stark impact and an imagery unparalleled in the animation field. Moreover, Lingford captures Andersen’s tale of grief, love and sacrifice very well, without trying to update it. Just by staying true to the essence of the original story she has made a timeless classic. Her wordless film is as universal as it can get, and capable of communicating to audiences worldwide. It’s a welcome antidote to the Disney fairy tale retellings, which get more and more watered down, and which lose a lot of the originals’ charm with it. The remake of ‘The Ugly Duckling‘ (1931) is the last of the Silly Symphonies and, like the very first (The Skeleton Dance, 1929) one of the best. Following Hans Christian Andersen’s tale much closer than the original ‘Ugly Duckling’, the 1939 version reaches the apex in animated storytelling. One can even watch it silent and understand the cartoon perfectly, and even more significant, remain emotionally involved, as well. The Duckling is an instantly likeable character whose emotions are totally convincing and moving. Even the colors of the backgrounds add to the drama, changing from bright greens to blues when the Duckling is expelled. The 1931 version was a milestone in its time, yet it looks crude and primitive today. 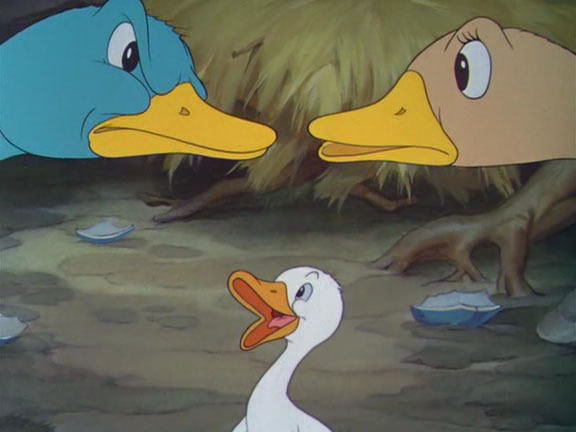 This 1939 version of The Ugly Duckling, however, is an all time animation masterpiece, and it will doubtless never date.